Miami Kidney Walk! Big success! | Healthy Kidneys | Miami Kidney Walk! Big success! We were so proud to sponsor Miami’s Kidney Walk for the National Kidney Foundation! It was an awesome event that brought the community together to raise awareness and funds to end kidney disease. Many friends, family, and new faces visited our booth, stopping by to talk to us about kidney disease, including what they could do to treat it, prevent it, or how to help support their friends diagnosed with it. We were stocked up with bags and bags of pens to give away, and at the end of the event, nothing was left! We were happy to know that people would be taking home a reminder of this event and it’s cause. As we spoke with many participants and got to hear their stories, we were inspired by the strength of this community and happy to be there to answer questions and provide support. To kick off the walk, one of our very own FKP doctors, Alberto Casaretto, gave a great speech about this year’s theme, “Kidney Health for Everyone, Everywhere.” He explained how important it is to act early, and let your doctor know about all the medications you are taking, even if they are vitamins! NKF also gave us beautiful recognition for participating in this event. We had so much fun meeting your families and walking to end kidney disease. This year’s walk was a huge success, smashing last years fundraising efforts by $25,000. We are just short a couple hundred dollars from $100,000! We’re very happy with the attendance and to see such a strong sense of community. It was a great day of fundraising and of celebrating kidney health. 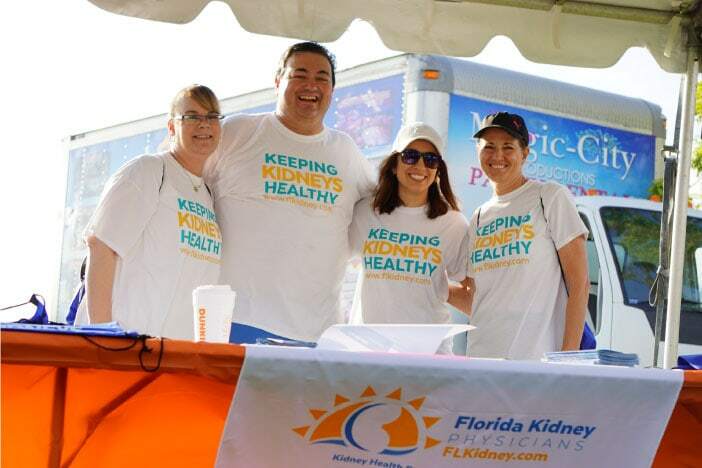 Florida Kidney Physicians sends a massive THANK YOU for attending the 2019 Kidney Walk in Miami with us!